This recipe is a proof-of-concept that it is possible on a camping trip to bake something like lasagna without needing to have a separate pot to boil noodles. 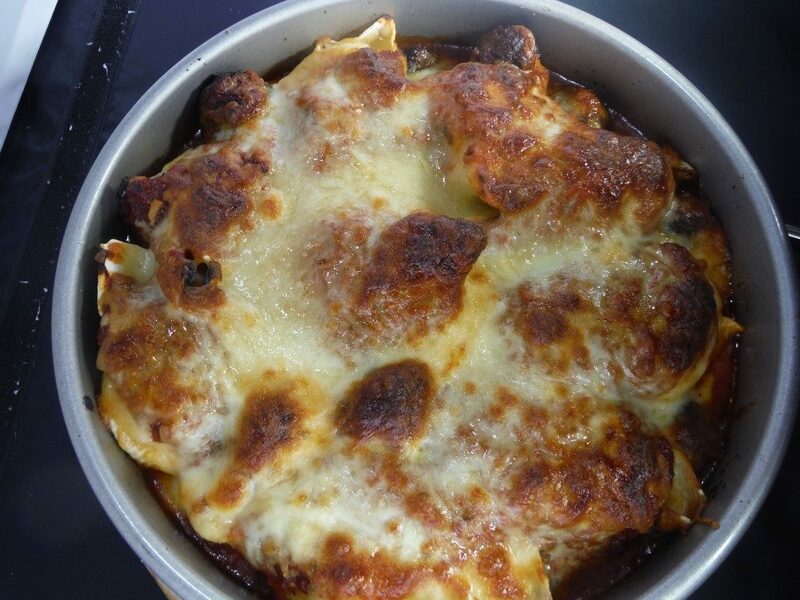 I was inspired by a recipe in Tim and Christine Conners’ The Scout’s Dutch Oven Cookbook, which used frozen cheese ravioli to replace the lasagna noodles and ricotta of the usual lasagna casserole. In this case I used frozen stuffed shells since they were cheaper at my supermarket than the cheese ravioli. (I think the next time I will use the cheese ravioli.) The resulting casserole was both simple and tasty. Enough for 4 servings fit into a 9 inch cake pan, which could be put inside a Dutch oven. For more servings, I would use an aluminum foil liner in the Dutch oven and would not use a cake pan. Break off little pieces of the Italian sausage and form them into marble-sized balls. Brown the sausage balls in a skillet. Put half of the pasta sauce in the bottom of the cake pan. Spread out the cooked sausage balls. Add the stuffed shells in a single layer. Add the rest of the pasta sauce. Top with the shredded mozzarella. Bake at 450 degrees for about 20 minutes until the top is brown and the shells are cooked through.